In his paintings there is always a schematic sense imbued with emotional naivety, which leads us to estimate the concept above the forms. He has found in Cadaqués the shelter that reminds him of the first impressions, those on which the ways of being of people and their ways of expressing themselves are based. Shigeyoshi Koyama was born in Osaka (Japan) in 1940. Twenty-two years later he moved to Tokyo, and soon after began his career as a painter. In 1970 he made his first trip to Paris, where he spent six months; From there he moved to Cadaqués, a town where he stayed until the end of ’82. It was during this period that he made his first exhibition in his native country, specifically in Tokyo. 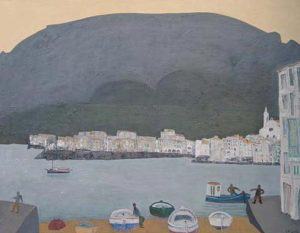 Years later, he returns to Cadaqués where he settled, finally, in the year 86. He has been a painter closely linked to this Empordà town since he arrived. Light, which is like the revealing hand of all that is visible, seems to have provoked the artist. This light is found in his works, painted -precisely- in southern and Mediterranean Europe, places that he seems to have chosen definitely. Koyama, however, evidences his oriental tradition in his own conception of the pictorial space: the perspective is not considered from the Renaissance canons, but develops the theme from the resolution of the plans. Therefore, in his works we find a different way of presenting reality: not as the eye perceives it, but as interpreted by knowledge and sensitivity. It works indistinctly the technique of oil and watercolor. His palette moves between blues and grays, but he does not forget the greens and reds, whites and oranges, which he chooses according to the time of day and the season. According to the art critic Francesc Galí, it is a chromatic fan that is useful to compose a painting -inseparable from the drawing- that gives rise to a combination, simple and wise, of spots (…) that stand out and differentiate the calligraphies (…) that complement the plastic descriptions that he argues. Koyama is still what it was in its origins: a painter who, from specific referents, creates atmospheres, worlds, timeless universes, which he places in Cadaqués, but also in Barcelona, ​​Paris, La Mancha, Albarracín, Sicily. And it is this real and imaginary artist, oriental and western, figurative and abstract, the author of what some critics have called the Koyama style, which does not cease to be a refined and consistent way of perceiving the world. I fondly remember the painter Koyama (Osaka, Japan, 1940) of some of his exhibitions in Barcelona. Especially the ones he did in La Pinacoteca, then taken by Rafael García -the heir of the affectionate nickname The art gallery that his father had given the followers of the art halls-, in the years 1983 and 1991. And also those that he organized in the space that was named after the gallerist María Salvat, a woman with an undoubted good artistic criterion, in the years 1989 and 2001. For that reason, I am now celebrating the painter in the Sala Rusiñol of Sant Cugat, from where Ignacio and Victoria Cabanas get, with Tenacity and good aesthetic taste, defend the banner of creativity within the current of realism. 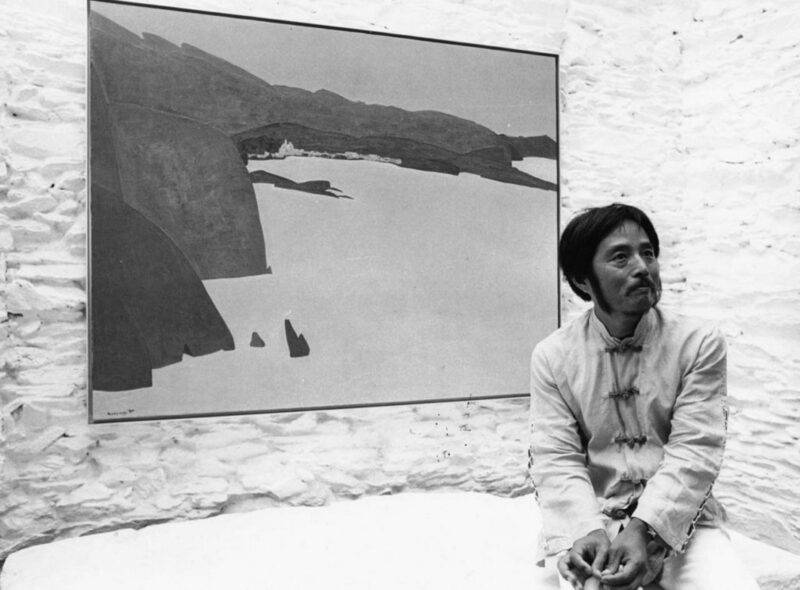 Koyama met Cadaqués for the first time in the early 70s, when from Paris he arrived by chance hitchhiking. The famous Empordà town, the geographically easternmost of Catalonia, has been painted by a large number of renowned artists such as Salvador Dalí – who had the chance to see Koyama’s paintings, and was praised -, Eliseu Meifrén, Albert Ràfols – Casamada and many others. Our Japanese painter also felt captivated by this population that, with the Sierra de Rodes behind, has always lived facing the sea, and wanted to pick it up in its fabrics. 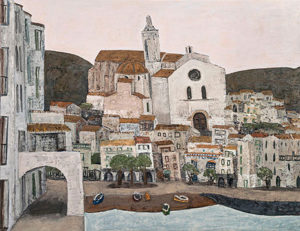 The painter from Osaka – to the island of Honshu, at the mouth of the Yodo river – connects perfectly with the maritime Cadaqués. The urban nucleus, a space of civility that is collected around the temple that gives room for spirituality, stands out for the white luminosity confronted with the dark mountains that rise threateningly in the rear. On the beach, the lone fisherman faces the fragility of a fishing rod in the immensity of the sea and seeks to rip off the treasures it hides. The boats, attracted by the hope that they always live on the horizon, risk venturing into open waters and do not fear the islets that resemble enormous whales that surround them. Between the mountain and the sea, the olive groves -First sisters of the Japanese cherry trees- symbolize the friendly nature of man. Koyama’s painting is essentialist, it searches and finds the transcendent truths that hide the forms of reality, and that are the same in Japan bathed by the East China Sea that in Cadaqués that looks at the Mediterranean.